Within the industrial control sector the interconnection between PCBs are often subject to vibration. Hitaltech has introduced a solution through flexible interconnect resistant to both stress and vibration. Designed to address the demands of the both the industrial control automotive market, Hitaltech’s range of flexible flat cable (FFC) combines the properties of flat cable with round pins for PCB termination. The manufacturing process involves flattening the round, solid copper conductors, creating a smooth transition from flat to round. The result is a flexible cable, which is highly resistant to vibration and bending and therefore well suited for applications in the industrial control market. A fully automated production line is used to manufacture the flat flexible solution for PCB to PCB connection, a PCB to component or an entire cable harness. Connections can be made permanent by soldering the round pin at each end or, for a removable connection, one side can be soldered and the other combined with a connector. For this purpose termination styles enable the use of ZIF / LIF connectors, crimp connectors or IDC. Special pin length or shapes can be produced for connecting or soldering a component directly to the cable. Windows in the insulation enable SMD components to be soldered directly onto the cable. For a complete cable harness assembly, Hitaltech can provide a set of FFC and ‘distribution pieces’, prepared for crimp or any other connection system. The FFC can be supplied with double-sided adhesive tape for easy installation. A range of eight pin pitches from 0.5 to 5.08mm is available and the length can be between 12 and 5,000mm. Various insulation materials are available and special pin pitches, mixed wire gauge and termination styles can be produced. Other options include higher current models and hybrid variants, containing optical fibres for signal and copper conductors for power. For a complete cable harness assembly, Hitaltech can provide a set of FFC and ‘distribution pieces’, prepared for crimp or any other connection system. The FFC can be supplied with double-sided adhesive tape for easy installation. A range of eight pin pitches from 0.5 to 5.08mm is available and the length can be between 12 and 5,000mm. TTI has announced the availability of the PC 35 high-current PCB connector from Phoenix Contact. 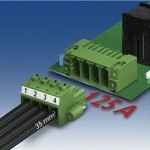 The connector, which provides reliable connection up to 125A, suits high-vibration applications including automotive, power supplies and solar invertors. 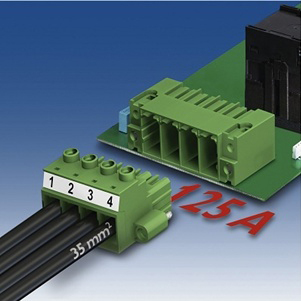 Typical applications for the PC 35 connectors, which are a recent addition to Phoenix Contact’s Combicon, include automotive electronics (including electric and hybrid vehicles), drive and power engineering, frequency converters, solar inverters, power supplies and motor leads. The connectors feature an integrated threaded flange for screw connection with the PCB as standard, which provides reliable connection even in harsh vibration environments. An integrated double steel spring ensures maximum contact reliability. Connection capacity is 35mm2. User-friendly device connection is said to be assured thanks to low insertion and withdrawal forces. Increased performance capability and user friendliness of Yxlon’s Y.Cougar and Y.Cheetah microfocus X-ray systems has resulted from the company’s the System Release 3.8 for the FeinFocus product lines. Resolution and the resulting image quality of captured radioscopic images is being improved once again through the new version of Y.FGUI (FeinFocus Graphical User Interface). The company states intuitive operation of the microfocus X-ray systems has been equally optimized further. The System Release has not only made user guidance even easier: the enhanced automation of programming enables the systems to be parameterized faster, too. In addition the new additional 3D option termed ‘Y.micro3D slices’ allows the highly detailed laminography of larger electronic printed circuit boards and increases the inspection flexibility of both system families.The Y.Cougar and Y.Cheetah X-ray systems for 2D and 3D microfocus inspection are compact systems for the rapid radioscopic inspection of smaller parts in real time. The first radioscopic image is created in a few seconds using these units. Functions such as ‘Click & Center’, ‘Frame & Zoom’, ‘Click & Fly’ and ‘Grid Inspection’ can be carried out with one click and distinctly facilitate working with these inspection systems. The CT systems, including the new System Release, are being presented from the 6th to the 8th of May at the SMT Hybrid Packaging trade fair in Nuremberg together with these new functional enhancements and improvements at Booth 523 in Hall 7. Left: X-ray Image with hidden structures. 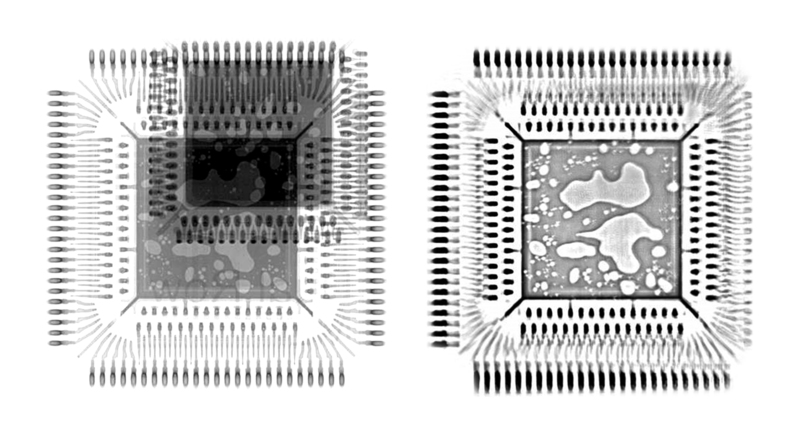 Image: Left: X-ray Image with hidden structures.Right: The Y.micro3Dslice shows all defects in the Die-Attach without interfering overlays. Rapid technology changes and miniaturization have caused a just as rapid shift of specialized equipment, normally present in traditional PCB assembly, to move into backend packaging industry, says Assembléon, who has introduced the concept, the advantages and technology roadmap of its hybrid equipment. The company states hybrid systems have a unique proposition in the PCB Assembly market as they are the only system incorporating a single-pick single-place concept, now capable of 7 micron placement accuracy. The advantage of a placement head that carries only one component at a time is that, at full speed, it can be fully optimized, monitored and controlled during the complete pick, dip and place cycle. The incorporated low-force closed-loop placement process takes care that even the thinnest devices can be placed accurate and its incorporated impact control sees that no impact forces are applied during placement to guarantee the highest quality. It therefore has high production yields with an established placement defect rate lower than 1 defect per million placements (< 1 dpm). Not only the placement speed, but the flexibility of component parts and PCB formats, as well as the ease of programming and the reliability of the assembly from lot size 1 are the decisive criteria for small batch/prototype production, says Essemtec. The company’s new Paraquda2 combines minimal programming effort and precise placement of all SMD components from 01005 up to large and complex components on a single machine. Equipped with two high-speed placement axes, the Paraquda2 is able to place up to 10,500 cph. The programming of small series and prototypes is done via a direct, universal import of CAD data. If there is no CAD data available, the virtual graphical overlay ensures the correctness of a program quickly and precisely, according to Essemtec. The graphical inspection prior to the first production ensures that even lot sizes 1 can be produced correctly. Nordson March, has introduced its new MaxVIA-Plus plasma treatment system, which accommodates larger panel sizes within a small footprint during electronic circuit board fabrication for desmear, etchback, and landing pad cleaning operations.The MaxVIA-Plus system treats HDI, flexible, and rigid panels. The larger, 15-cell chamber in the MaxVIA-Plus system processes more units per hour (UPH), resulting in high throughput and maximum production flexibility. Its unique vacuum and gas flow technology, new electrode designs, and superior temperature management creates a plasma system that delivers highly uniform PCB treatment. The system features a compact and service-friendly design. The PCBs are vertically loaded using easy-loading carts, which minimizes idle time and improves productivity. The fast vacuum pump down, low gas consumption, and enhanced process cycle times further add to the throughput and productivity of the system. High precision is a critical factor for laser cutting of SMT stencils, according to LPKF who says its new stretching frame for stencil foils achieves continuous tension with a homogeneous tensioning force distribution. A single tensioning system suffices for the entire range of standard stencil sizes. The variable frame guarantees fast changeover from one size to another and slashes setup times. The LPKF stretching frame was designed for fast and easy use in production. A newly designed clamping mechanism ensures even clamping of the foil to ensure a high cut quality. 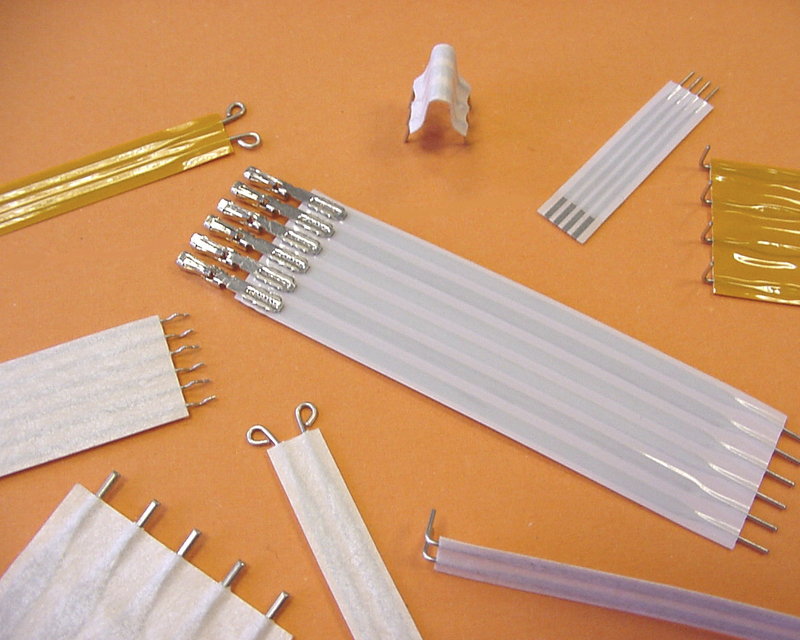 In three steps, the operator receives a perfectly tensioned solder paste stencil. New developments automated soldering machines and customer-specific systems are being offered by Seho Systems for more productivity in electronics manufacturing. Fore example, the Synchro concept, an innovative highlight of the new selective soldering system Seho SelectLine, is an intelligent software feature that coordinates the soldering process for two PCBs in such a way that the total throughput is nearly doubled without the need for significant investment. The assemblies can enter the soldering area independently and are not linked to the same cycle. With the new Synchro concept, cycle times can be reduced by nearly 50%, says Seho who has also announced innovations to reduce maintenance times and more integrated solutions for high precision and flexibility in process control. Provider of advanced X-ray inspection systems, VJ Electronix has launched the Summit II next-generation rework system, complementing the XQuik and the Micra Rework System. The company says Summit II combines the latest in controls and ergonomics from the Micra with the throughput and accuracy of the Summit 1800. Summit II features a smaller footprint, yet larger board capacity with easy to adjust board support fixtures. Enhanced SierraMate software takes the popular user-friendly operation to the next level with a simple icon driven GUI and unmatched flexibility through easily customized operation sequences. Other additions include improved lighting and optics for alignment of difficult components. Both, chip production and chip processing are experiencing a strong trend towards rationalization, for example in the field of chip encapsulation. In applications subject to high chemical and thermal stress, large-area encapsulation has previously caused warpage of the PCB during curing. This effect caused tensions within the assemblies and made singulation of the packages by sawing difficult. This warpage is the result of dissimilar coefficients of expansion of PCBs (10 – 20 ppm/K) and encapsulants (more than 20 ppm/K in most cases), Delo’s enhanced encapsulant achieves a CTE value of 11 ppm/K. 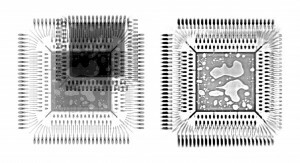 Warpage is reduced to a minimum, which makes this encapsulant perfect for large-area chip encapsulation. – Siplace optimizes workflow in multiple line SMT production.